When it comes to drinking, snacking and playing a game of pool at the same time, stains will happen. A drink set on the rail of the table spills onto the felt, or a friend drops a cheesy snack chip on the table, leaving behind a bright orange spot on your non-orange pool table. Cleaning up the stains requires a gentle touch and gentle cleaning methods, such as a vinegar and water solution, to avoid damaging the felt. 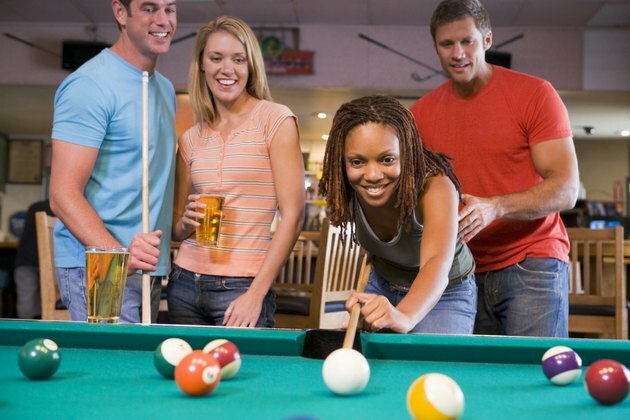 Keep drinks away from the pool table to avoid spills and stains. Blot the spilled substance up as soon as possible using a lint-free white cloth. Continue blotting with a fresh area of the cloth, or switch to another cloth if the first becomes saturated. Blot until you've removed as much of the substance as possible. If the spill is a food-based item such as salsa, grab the food particles with a paper towel or lint-free cloth, then blot or wipe as much of the substance up, wiping from the outside of the spill toward the center. Skip this step if the stained area is already dry. Rinse a lint-free white cloth in cool water, then wring most of the water out. Dab the stained area with the wet cloth without rubbing the stain, as this may damage the felt. Rinse the cloth again. Pour 1 cup of cool water into a bowl and add 1 or 2 capfuls of white vinegar. Swish the mixture gently with the lint-free cloth and wring out the excess liquid. Dab the stained area with the vinegar solution repeatedly. Rinse the cloth out, re-dip it into the vinegar solution and dab the affected area again until the stain vanishes. Allow the felt to dry completely before using the pool table. If the stain is still visible once the felt dries, dab it again with a vinegar and water mixture, allowing it to dry completely.